Man, for some reason the fact that my backdrop is a dirty pink tablecloth is really obvious in the above pic. 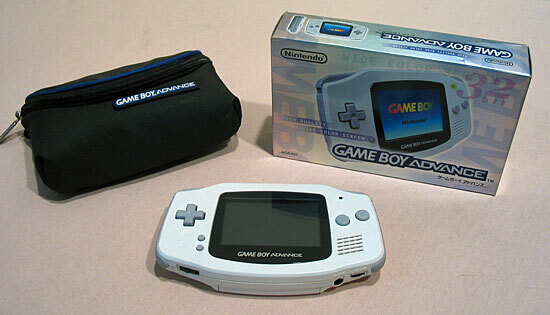 Anyway, this is a Japanese GBA, functionally identical to the US model with the only difference being the sticker on the back. This is also a launch system – purchased from an import store here in New York. The case came direct from Nintendo (I had some contacts with them at the time). I was really excited about this launch – I was working in the game industry so I got sort of caught up in the hype, and by that time I’d completely gotten over my anti-handheld bias. 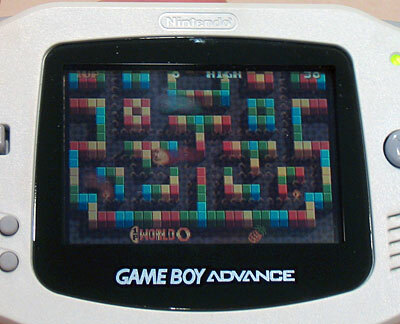 Plus, it was the first true upgrade of the Game Boy’s internal hardware since the system’s launch in 1989 (color screens don’t count). At the time I bought this, the only colors available for the system were white with grey trim, clear purple with orange trim, and purple with white trim. I thought white was the most tasteful looking. Now that the SP (and DS) are on the market, though, this thing looks a little clunky – and it’s also yellowing around the edges (why oh why do Nintendo products always have this problem? ).